HMS York (D98) a Batch 3 Type 42 destroyer built by Swan Hunter at Tyne & Wear and launched on the 20 June 1982 by Lady Gosling. She is the 9th Royal Navy ship to bear the name. Operationally she has taken part in the 2003 Iraq War and in 2006 evacuated British citizens from Beirut during the Israel-Lebanon conflict. During 2010 and 2011 HMS York has conducted patrols around the Falkland Islands. She was 462 ft 7 ins long with a top speed of 30 knots and a displacement of 5.200 tons. 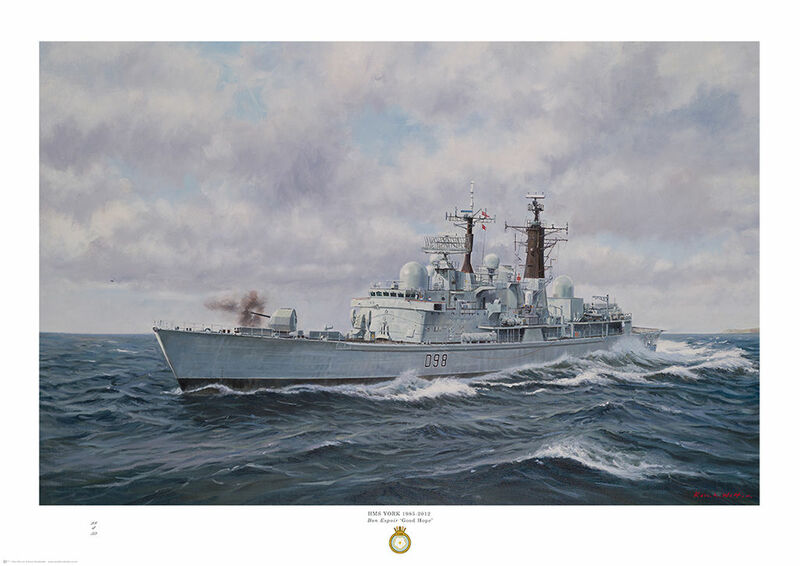 She decommissioned on 27 September 2012, the original painting was presented to Lady Gosling. This print has the 4.5 inch Mk 8 Mod 1 naval gun.